Avira Antivirus Suite 2014, formerly known as Premium Antivirus, concentrates on the protection aspect which makes it ideal for users who want their PC protected but do not want or need additional features such as backup or parental controls. You can configure the protection in detail if you select the custom setup option during installation, or use the recommended settings instead. Real-Time Protection - Permanent monitoring of file access on the system in real-time. Mail Protection - Scans incoming and outgoing emails and attachments on POP3, IMAP and SMTP connections. Windows Firewall - Control the built-in firewall from with the Avira software. Rootkits Protection - Enables the detection and removal of hidden malware. Protection Cloud - Uses fingerprinting to check suspicious files in an online database. Web Protection - Protects web browsers against viruses and malware. Shell Extension - Integrates Avira into the Windows Explorer context menu. While it is not recommended to disable real-time protection for example, you may want to disable features that you have no need for, for instance if you use another security program in the area. Note: The installer will display options to install the Avira SearchFree Toolbar powered by Ask during installation. If you do not want to install the toolbar, make sure to hit the don't install button. The main interface of the application displays relevant information about the status of PC and Internet protection directly, providing you with an overview of that right away after start or bringing it up to the front. All installed modules are accessible directly from the homepage, which improves usability considerably, especially if you are used to antivirus software which use a layered approach. The homepage highlights the date of the last update, the activation status of the product, and provides you with options to run a scan right away. You can enable or disable certain security features here as well, like real-time protection or safe browsing. Most sidebar items link to configuration pages. The firewall configuration for example provides you with options to configure it directly from within the Avira software (it offers a control interface for Windows Firewall). You can hit the F8 key alternatively to open the configuration for all items directly. You may want to go through all settings here at least once to make sure that everything is configured after your liking. Here you can for instance enable the scan for rootkits prior to the system scan, enable the scanning of archives, the monitoring of network drives, or switch on complete logging. A default values button is provided to reset preferences which can be useful if you want to start over from scratch. Some of the links in the sidebar point to products that need to be installed separately. This includes the mobile protection app for Android, and also Avira Free SocialShield for social network protection. Cloud scanning has become one of the cornerstones of security solutions in recent years. What makes it interesting is the fact that the cloud database is always up to date, while the database of the antivirus solution on a user system may not be. Another benefit of the approach is that it accumulates data from all users of a particular product so that it can react to new malware as soon as it is discovered. Avira's Protection Cloud compares fingerprints of suspicious executable files against its database to identify potentially dangerous files. Files that return a positive hit can be uploaded to the cloud so that they are scanned remotely and be classified as either safe or malicious. Avira notes that documents, pictures or other personal files are never uploaded to the cloud. The program is configured to display a prompt before suspicious files are transferred to Avira. A nice interface and lots of options may increase the usability of a security program, but it all boils down to the level of protection that it makes available. In AV-Comparatives real-world protection test, Avira managed to gain one of the highest scores in the test. Scores were equally impressive in the company's malware removal tests, and general system performance tests. Avira's Antivirus Suite 2014 uses an insignificant amount of memory when it is running on the system in the background. On a Windows 8.1 Pro test system, it used less than 10 Megabytes of RAM across its five open processes. This increases during scans, but will quickly go down again once the scan finishes. Avira Antivirus Suite 2014 is a lightweight security program for all versions of the Windows operating system that is easy to use and maintain. The interface is streamlined for ease of access, with every feature reachable from the first page directly. The options provided during installation are great, as they enable you to configure the program exactly the way you want to use it. A drawback is the inclusion of the toolbar during setup, or at the very least the checked state of the product. Other than that, there is little to criticize. If you are looking for a lightweight effective antivirus solution, I suggest you give this one a try. A 30-day free trial version is available for download on the Avira website. I currently use Avast! AV. Thanks for the contest. i m using Avast free. Thanks for the review & contest! I’m currently using Avast Free AV. Currently using Avast Free, I have used Avira Internet Security around a year ago, but due to financial problems, I’ve switched to a free one temporarily. Nice review, always loved their products. Microsoft Security gives me a false sense of security. I totally live on the edge. I’m currently using Avira Free Antivirus, which since it stopped displaying the popups is even better than before. I really value the ‘block autorun’ function and windows host file protection which rarely are available for free in an AV software. I’ve been using it for a long time and haven’t had any problems. Even regular Malwarebytes Anti-Malware scans don’t detect anything. However, there are some strange decisions. Both turning off and ON require typin administrator password in UAC on Windows 7 – and usually it’s only required for disabling the protection. Turning it off is sometimes necessary for large steam games decompression (the last byte in downloads progress) as Avira can make it take up to 3 minutes (but that’s only because I’ve set it to scan every file instead of using smart extensions). Another strange design choice is putting the ‘configuration’ button in ‘extras’ dropdown menu. As for firewall I’m using Comodo – mainly because I value the ability to set separate connection profiles for every application and process. I should add that I’m using No-script and I’m on a normal user account with non-dictionary admin password. Using MSE at the moment. I’ve never tried Avira. An interesting review. 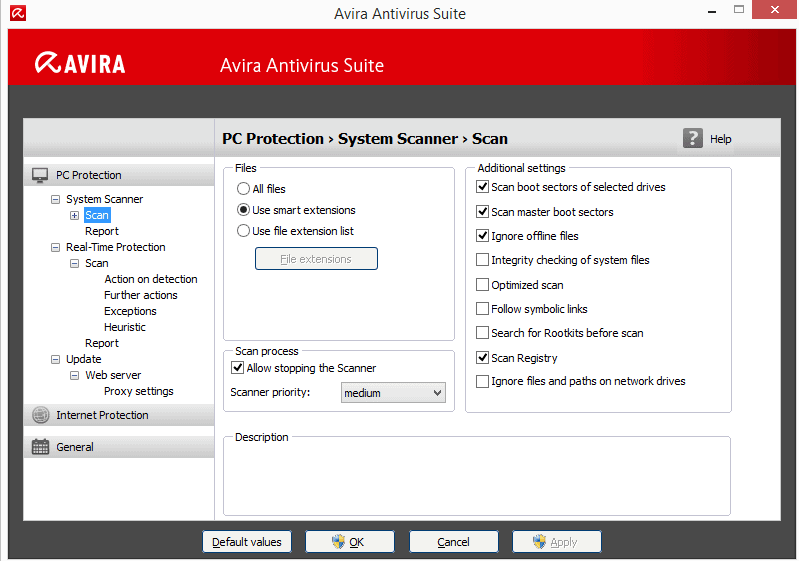 Avira Antivirus Suite – simple, easy and reliable antivirus. Includes comprehensive protection against viruses, identity theft and financial losses. This great set of security tools is the ideal solution to protect a user, computer and critical data. 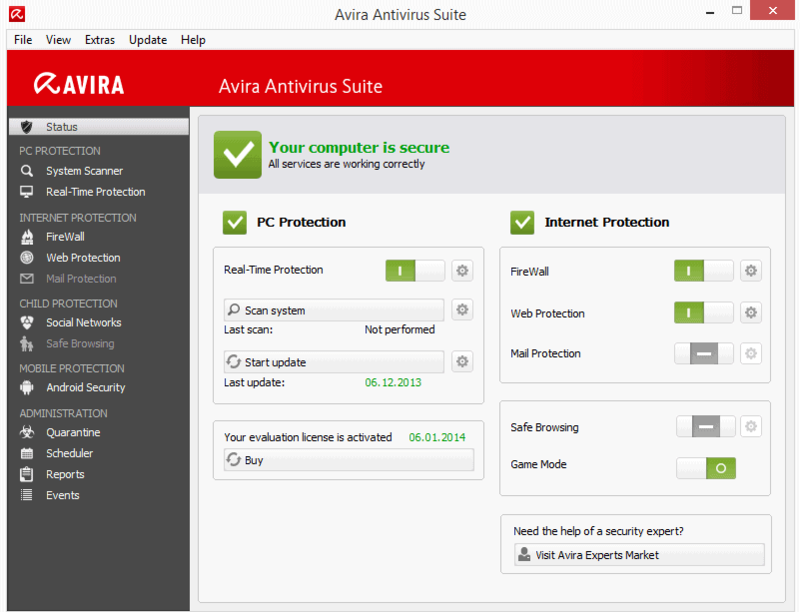 New Avira Antivirus Suite uses advanced and effective anti-virus protection features, including cloud-based detection. Being using Avira Antivirus many years now. Unfortunately I had to install the free version when my last license expired (no money to renew it, right now). For me the best antivirus. And not only for me but for av-comparatives.org too! I always advise my friends to buy it. On the ‘free side’ I have been more with Avast and AVG, but tried Avira a few years back, and found it was good. For me AV-Comparatives opinion matters, so I would try Avira of course. Not liking too much the ‘Avira SearchFree Toolbar powered by Ask ‘ option, never liked Ask getting in the middle of Internet searches, changing my homepage, etc. I am using Kaspersky. The best of them all. I have used avira at least for the last ten years now. Up until my migration to Win 8 I always went with the premium version for the firewall features. Many people will swear by AV X or AV Y being the best because they got no viruses, but often the AV was never actually tested. I used to fix PCs etc… and one of the things I would semi-regularly do is try and replicate the steps that the user did to get a virus. Avira always caught the virus. Great product. wow, this is wonderful gift for me :), I use Avira Free Antivirus for several years. thank you so much ghacks.net! I currently use trustport IS 2014. thanks for the giveaway again this year. I’m currently using Qhioo 360 Internet Security along with Malwarebytes Free. would give it a try. Count me in Mr Brinkman! I’m in!! I’m currently using AVG Free. I switched from Avast! because it caused a major slowdown of my Windows 7 system at startup. I also think that AVG’s detection rates are better than Avast!. Thank you very much for this review, I would like to give Avira a try. My security configuration is quickheal antivirus but its license will end on 20th December this year. Therefore, I think if I win one of Avira license will be very happy. I am currently using the free Avast Version, with minimum modules installed, so as not to hamper the PC normal operation, for instance when browsing websites. Please count me in for the draw. Thanks. Thanks ghacks & Avira . I am currently using AVG along with Malwarebyte. Currently using CIS myself, haven’t got any problem and it actually seems a bit faster than even avast. Currently using Avast Free, but Avira’s a close second to Avast in my antivirus selections, and I’ve used it in the past. Would love the opportunity to try out the premium. It’s been a while since I’ve used a comprehensive security suite, choosing to go with a combination of a number of different programs. Currently I am running Microsoft Security Essentials, along with the Pro versions of Malwarebytes Antimalware, SuperAntispyware, and WinPatrol (which is one of my favorite programs). Over the years, I tried Avast, AVG and even Comodo – but found them all to be a bit heavy for my needs of basic home computing activities. I have never tried Avira, although am certainly aware of its excellent reputation, and after reading your review and taking a look at the clean interface and basic approach, I would love the opportunity to put this on my system. I’m assuming if I install this security suite, I would need to remove MalwareBytes and SuperAntispyware – correct ? In any case, thanks very much for your wonderful giveaways – it’s always makes the holidays a lot of fun. Thanx for this fine giveaway ! I’m using avast! Free Antivirus. P.S. I’ve only got one leg. My Kaspersky license expired a week ago so Avira would be great to get now. Using MBAM and Hitman Pro with avast! Free. Correction: I’ve decided TO use, not no use. I’m currently using McCafee… I know, please don’t hate me! I am using Microsoft Security Essentials at the moment. excellent Antivirus program that will protect our system against a variety of viruses but once I had it my promotion has ended but gladly stay again for him.please me to count. Avira is a very good security software. I currently use CIS. Thanks for the giveaway and good luck to all. Thx for the review, sounds good. Thanks for the review. Don’t think I’ve heard of this AV product. I think for all AV products, each will have their good points and bad – it’s finding the one that best suits your needs. up until recently I’ve been using Security Essentials ( or whatever it is officially called on Windows 8 ). For my desktop PC I now have Bit Defender, seems to be working OK, but how do you really know until it catches ( or doesn’t catch ) a virus. Been looking for a good AV product for my net book though. Just checked my processes and it appears Bit Defender uses between 50 and 60MB of RAM which is a little much on my well used net book with only 1GB of RAM. Thanks again for the review, I’ll definitely have to look into Avira for my net book. I’ve been a long time user of Avira Anti Vir which has served me well over the years. This seems to be the icing on the cake. I would like to try out the Avira 2014 Suite. I’ve been using MS Security Essentials across all my computers, and it’s what I usually recommend to my “savvy” friends. I use avast right now, but I’d like a chance to try something else. I currently use ESET NOD32 Antivirus 7. Well, lets have it then! I’m testing Norton Internet Security for 60 days (new PC) and use it with Zemana Antilogger. MalwareBytes free is also installed. Have used many different type of antivirus/protection software. All seem to have their pros and cons. Hope to try Avira soon. I’ve been using Avira Free A-V since 2008 on my own machines (XP & Win 7). Over the past few years, I’ve since installed it on more than a dozen other Windows boxes (XP through 7) that I care for. Protection is augmented with the Comodo Firewall, Microsoft’s EMET, CryptoPrevent, WinPatrol, either Open DNS or Comodo DNS, SpywareBlaster and the Firefox browser (with NoScript, HTTPS-Everywhere and the Web Of Trust add-ons). With a cumulative total of over forty machine-years, none have had an infection (on-demand scans are done with Malwarebytes every other week, on average). For the technically inclined, Avira is highly configurable; version 14 eliminated the infamous update nag screen and added significant improvements. My only quibble is that on older machines with single-core, single-threaded processors, updates drive the CPUs to 100% for from sixty to ninety seconds. Too much of my time is spent removing malware from machines running other security solutions (usually Norton or McAfee); after they’ve been disinfected, I remove whatever was in place and install Avira (along with the other aforementioned enhancements). In short, Avira Free is a gem, and it would be a welcome experience to see how the suite performs for a clean install of Win 7 in a machine I’m currently building. Another good add-on for Firefox to use for complementing NoScript protection is RequestPolicy. The two work well together. I’ve been using Firefox since 3.1 was released and NoScript for … plenty of years anyway; maybe since 2005 or 2006. RP is one I began using only this year and it’s a little bit of a nuisance, aka pain in the back, for we need to tell it what to allow, while letting it continue to block the rest, but this is also like with NoScript. Both reload pages when users unblock pages as well as when we set the block again. The only time NoScript doesn’t reload a page is, f.e., when a user says to temporarily allow a domain and subsequently changes this to permanent allowance; until the user decides to disallow or block the domain again, anyway. RP has temporary and permanent allowance, but when changing from one after having RP use the other, then RP will again reload the page. Otherwise, and for automatic reloading of Web pages, the two add-ons do the same thing. When first beginning to use these two add-ons, then users can be frustrated; but, the added protection is worth practicing the virtue of patience. I have multiple Firefox profiles and choose whichever one is to be used when starting Ffx by running Ffx with the -P option for the Profile Manager. One profile lacks RP in case RP might be an occasional problem with my main profile. (The secondary profile also lacks other extensions that’re added to the main profile, … .) If I think that RP (or another add-on added to the main profile while lacking it in the secondary profile) is somehow being a problem, then I bring up another Ffx session for a secondary profile by using the –no-remote and -P Firefox parameters or options. -P is necessary when wanting to run a second Ffx session, using a different profile (a must), while already having a Ffx session running. Two different instances of Ffx can’t be simultaneously run with the same profile. If we try, then we just get an additional window opened for the same profile; rather than getting a separate Ffx instance. –no-remote, based on what I read at MozillaZine.org some years ago, is or was mainly intended for developers/maintainers of Ffx, but the option is available to all users. People can learn more about this option by doing a Web search of Mozillazine. There isn’t much more to learn about it though, if anything more at all. When running a separate/second instance of Ffx while one is already running or open, then both Ffx sessions run side-by-side without any problems, when running one instance with –no-remote -P. I repeat this in case a reader wonders if it might be a problem to run two instances at the same time. There’s no problem, not if a user has sufficient RAM anyway. I have 3 GB since XP doesn’t see more than this, but 2 instances of Ffx run fine at the same time with 3GB of RAM. The only time it might be problematic, bogging down the system, is if one instance of Ffx has a VERY LARGE number of tabs open, for then the instance of Ffx comes to take up a considerable amount of RAM. This is off-topic for this page, but I figured that since AJ North wrote of what he uses for software and Ffx add-ons when it’s unrelated to the topic of this page, well, I’d just add this comment. Hopefully, this is okay. Currently I use only Microsoft Security Essentials. I think it’s about time I back that up with additional protection. Firstly, not commenting here to participate in the giveaway. We had installed Avira antivir 2012 on our system running windows 8 and it totally screwed things so badly for us that we had to reset it. Currently we’re using Bitdefender which is much more robust and light on the system. No problems so far. Currently I am using Kaspersky antivirus 2013 edition and Zemenna antilogger. My Antivirus subscription is expiring soon and would love to switch to Avira. Hope i am lucky this time. very good! My antivirus is avira free. Currently using TinyWall Firewall, Webroot SecureAnywhere, SpyShelter Stoplogger Premium and Sandboxie Free. I’ve used Avira Free before, and liked its detection abilities, and nimble footprint. The red umbrella was an integral part of my security configuration for a few years. The complained about notifier didn’t seem that obtrusive and couldn’t detract from the lightness and great protection, a little price to pay for a very capable free security application. And all the while there were the much discussed and questionable associations with toolbars; and the innovation seemed to have plateaued a bit; it was just a question of time for Avira to introduce their cloud infrastructure and intelligence, and to rightfully claim once again their spot as one of the best products available. The clear and concise presentation hasn’t changed, and that is not necessarily a bad thing, considering the promo-heavy and upselling-oriented interfaces of other products. Thank you for yet another great giveaway, Martin, and the opportunity to participate. I generally bounce between MSE and Avira, so it would be nice to have the Suite to try it out. Thanks for the chance to win this. I am a happy customer of Avira Internet Security Suite. Tried most of the other major ones but can’t somehow get as satisfied as I am with Avira IS. The best things I like are its real time updates and it does not slow my machines down. Used Avira free for years. Like to get a full version. Thanks for the giveaway! I’m currently using Microsoft SE and need to move-on to real protection! I use MSE and Malwarebytes. Thanks for the opportunity for Avira. I currently use MS Security Essentials and am looking for an upgrade. Using free AVG antivirus with limited features so I hope to win Avira full version for more comprehensive pc protection. Thanks. I am curious to try the full fledged version, especially if it includes the firewall. I am currently using windows defender (windows 8.1) and Zonealarm firewall on my primary computer. I have debated about going back to NOD32 because of how efficient that program was (though I was coming from McAfee when I first used it). I have heard good things about Avira, and given it’s on ghacks, you know it’s a decent program. So i’d love to try it out for a year. Everybody should select their virus solutions based on their needs. I surf over the edge. I’ve been using Avira free because of it’s ‘in the wild’ detection rates – Superb! I’ve been using Avira since MS bought Giant and proceeded to neuter it. I know the paid version of Avira has more features, but It would be nice to see if the paid version has any new features/integration that are worthwhile for me. A one-year ‘trial’ should provide that info – 30 days just don’t cut it.. I use Avira free, AppGuard and EMET. Avira is the lightest great free AV. I hope to win and upgrade to their premium product. I regularly change my AV, based on the most recent results from AV-Comparatives. Time to switch back to Avira from Avast! I’m currently using Windows Defender which is built into Windows 8.1. I’ve never found an antivirus solution that is quite right for me so maybe this is it! always respected avira detection and looking for a paid anti virus. im an avast fan and dont know whats better than that! I’m currently with KAV But I think i should switch to Avira as it suits what I expected of an Antivirus more. I am currently using Avira Internet Security 2012 (license is expired). Moved from AVG to Avira Free years ago & never looked back.Absolutely solid with minimal footprint. In fact,not sure as I’d use the full suite as I use Avira with Malwarebytes & Spyware Blaster. Finally still using Avira. Still in Free version. I’ll be glad to have a licence and test all the suite by myself. no antivirus is installed in my another computer. hoping that this give away will clear it. Kaspersky Internet Security with a licence which is to expire soon after Christmas. Malwarebytes Antimalware scans from time to time. I currently using nothing…. but i love avira. I currently use MSE and malwarebytes free, and would love to upgrade. I used Avira free and premium for years, they were great. last year AVira premium started to slow down my old machine. Then I switched to Kaspersky Pure, which I am currently using. Avira and Kaspersky are the best. My only concern is performance, I have one month of license left so still trying to decide between these two. I would like to enter the Giveaway. Currently running Microsoft Security Essentials/Windows Defender on native win. I’m not using anything. Relying solely on Windows Defender. With so many options with double the opinions and tripling the confusion, it’s hard to choose an anti-virus. Some say just play it safe while browsing and use common sense, but that of course isn’t full proof. Using Avast Free on my home pc along with Malwarebytes. Had used Avira once and found it to be quite good, just that the popups were too invasive and distracting. Willing to give this new version a go. I’m using Microsoft Security Essentials but I really need a change! I’m currently using Avira Free Edition. I’ll be really happy to get Suite version. Im also Using MBAM and Hitman Pro with Avast. yes would love to try this. still using Security Essentials………. Currently using AVG Free 2014, and have used AVG for about 7 years now, and it’s only let me down once (a drive-by Fake Antivirus); would love to try Avira. Like the options while installing. Currently use MSE, but would welcome this one as have used it once. I currently use a cobbled suite of programs including Microsoft Security Essentials, Malwarebytes, and Spybot Search and Destroy. The review for Avira sounds interesting…and I’d be willing to give it a try. I’m currently using Comodo but still like Avira. Hello Martin, thanks a lot for this offer :). Currently I’m using avast free, together with Malwarebytes, Hitman Pro and Private Firewall. I used to be an Avira fan for years, but I didn’t like the toolbar policy that Avira has adopted some time ago. Fortunately, it seems they have abandoned it, so I would very much appreciate the opportunity to try the new avira :). Please count me in. So I wonder which toolbar you’re referring to. If you mean Ask, then perhaps you could just install Avira Free AV 2014 and then re-install it while remembering to de-select the two Ask options in the Avira installation GUI. Using Malware Defender running real-time in Normal mode, I learned that we stll get offercast_avirav7_.exe installed with the installation of Avira Free AV 2014. This offercast executable is from APN, “Ask Partner Network”; having checked for this in the file database at SystemExplorer.net. But, it may possibly be only for Avira offers, like for offering Avira upgrades, f.e. As long as that’s all the user will get for offer pop-ups, then it’s tolerable for a free version of Avira. However, if the user will also be notified of offers for unrelated third-party softwares, then this’ll be annoying and shouldn’t happen. None have appeared since I installed Avira Free AV 2014 several days ago though. My Web Protection shield is disabled and this might be due to having told Malware Defender to deny installation of some offercast installs, files, registry changes, …, while having allowed some others. If I told MD to deny them all, then the offercast executable still got installed. Web Protection shield, however, seems to require installation of some toolbar specifically or else very related to the functionality of the shield. I don’t think it’s the Ask thing that people installing Avira can opt out of, but maybe it is. It doesn’t really matter to me though, for I don’t want anything added to Firefox and will just use Avira Free AV 2014 without the Web shield enabled. It’s how I’ve always known Free or Personal Antivir to be and it’s always been suitable for me. I surf carefully though and some people don’t. For them, the Web shield is probably a good idea to have activated. I currently use Security Essentials, Malwarebytes (free) and Spybot. It sounds like Avira might be a worthwhile addition especially for the real time protection. Thanks for the free chance at the Avira Suite along with appreciating your somehow managing to publish a useful Ghacks every day. Installing Avira Free AV 2014 will complain about Malwarebytes, even the free, use on demand, only, version, and will surely complain about MSE as well as Spybot. I don’t know if you need to do anything in the cases of MSE and Spybot, but you probably do. When it comes to the free version of Malwarebytes Anti-Malware, however, you can just tell the Avira Free AV 2014 installer to continue while doing nothing about MAM. The Avira installer apparently can’t do anything about MAM anyway, but I had Avira Free AV 2014 ignore MAM when installing this Avira version several days ago; simply clicking on Next or whatever the button is named. MAM (free) remains installed and continues to be used without causing any problems. If you have it running r-t all of the time, then maybe this could cause some conflicts with Avira Free AV 2014. This requires input from far more expert people than I am. Based on what I’ve read over the past year or so, they’d say to either uninstall Spybot or to disable its r-t all of the time operation. It still takes the experts to be able to provide more accurate or definitive responses to this type of question though. All I can say for sure is that you can install Avira Free AV 2014 with free MAM installed without any problems by just telling the Avira installer to move on to the next step of installation. After all, if MAM isn’t running r-t all of the time, only being run on occasion and on demand, then there’s no way that it should interfere with the operation of Avira running r-t all of the time because MAM is normally dormant. I only use MAM on demand when verifying downloads. It doesn’t seem to do any good, for it never reports finding anything suspicious; but, I continue to use it on demand anyway. It has to be okay to use it this way, I figure. You probably have MSE running r-t all of the time and may have Spybot doing the same thing. It’s been said for many years that no two AV’s should be running in this manner, so, f.e., MSE and Avira or Avast!. Spybot was formerly different in this regard, but it seems that this condition has changed with enhancements made to AV’s. My guess is that more expert people would tell you to disable r-t all of the time execution of these two applications, and some might tell you to wholly uninstall these. I wonder if it’s really necessary to uninstall them if they’re set to run only on demand. If it isn’t a good idea to run them that way with Avira running r-t all of the time, then the question is why not. For now, and only based on what I’ve read, plus a little instinct, I’d suggest that you change MSE and Spybot to run only on demand and then tell the Avira installer to ignore these apps so that the installer continues with the rest of the Avira installation. Let Avira run r-t all of the time and use the others only on demand. I don’t have a clue why that should or could be a problem. I am a huge fan of Avira, recently have checked some reports that Avira is one of the best Free Antivirus. Always used it. I use Avira since 4 years now and have been happy since. It is one of the best in terms of detection and does the job efficiently without hogging too much system resources. I would love to give the premium suite a try. Count me in for the giveaway. compare progs I’ll never find what’s good or bad. I still stick on Microsoft Security Essentials. My current security setup is Avast Free with Sandboxie free. One my Laptops and my desktop i am using a trial of G Data Antivirus 2014. On my other laptop i am using a trial of Kaspersky Antivirus 2014. At one time or another i have tried most of then that are out there. Some are fairly good and some are awful and some are just plain resource hogs. I would like the chance to try out Avira. I use Avast Free and Comodo Antivirus on Windows 8.1 64-bit with Malwarebytes Pro. I doubt I need Avira as it has way to many false positives, but my I know quite a few people who would love it as it is fairly light on resources. I am currently using Avast Free antivirus which is far better than AVG but i got Avira Antivirus Suite then i will start using this rather that avast. Kindly count me in, i am using Comodo IS.. I use Avast free antivirus. But I’d like to try this one. I use nod32. Avira sounds impressive. I actually use MS security essential in windows 7. Avira Antivirus is world’s no. 1 antivirus security solution software. I currently use free version. Thanks for Avira Antivirus suite 2014 giveaway. I used to be a huge fan of AVG but then switched over to MSE for the past 5 years. As of last week I am now running Avast. All of which were the free versions. I am currently using avira free. It works fine and low on resources. When helping friends, most always install avira for them. I’m on Windows 8.1 Pro with the Built-in Windows defender and SmarScreen (the OS variant, not the IE variant) both enabled. I found SmarScreen to be rather useful for blocking unknown or 0-day threats. It is not a full-fledged HIPS, nor do I think it should be, but it does exactly what the average not risk-taking user needs. On top of that I use Sandboxie for sandboxing, a hardened enough (nothing too crazy) security policy, images of the OS status after major changes, and regular backups of important information. For experimentation purposes I also have a Virtual Machine available. Taking snapshots (images) of the system in the appropriate interval can also come in handy. A virtual machine is, to me, a near perfect solution for testing softwares and/or taking educated risks. And of course, backups, backups, backups of all important information. With a good layered security system a real-time protection by an AV is just the finishing touch, and arguably not even necessary (on-demand scans still are). 5) Anti Virus, Anti Malware as the last line, piece of mind, of defense. For users with sensitive information, encryption is also pretty much a must. I’m currently using and testing Bitdefender (free version). So far so good, but I gladly move to Avira premium. i’m using avast free.wouldn’t mind trying Avira. I think this is a very good internet protection suite, although i use KIS 2013. I look forward to hearing some very good news about this product. It`s important to mention that in the past i was an avast antivirus user. I currently use AntiVir public edition. Would love to use the suite. It’s simply the best antivirus software out there! Awesome giveaway! Currently using malwarebytes only, since I’m always careful when browsing. I love Avira, it is very good AV. Great review! I’ve always wanted to use Avira but I’ve heard about ads in free version so I passed. I’m currently using Avast! Free and Malwarebytes for scanning every file I download. In the past I used Comodo, Kaspersky, Norton and AVG. Comodo was pretty good but I didn’t like that it’s main security was HIPS which I’ve found really annoying. Kaspersky was worst of them all because of performance hit I got when I’ve used it. i’m a fan of avira, thank you very much!! Currently using Qihoo 360 internet security, would like to ditch the great wall of China for German efficiency! I currently using Avast on my Mac computer. It works pretty well, and i find the program through this article. Hope others can benefit from it, as I did. My kaspersky license just expired. Looking to change things up a bit. Please count me in too for this Antivirus Giveaway. I don’t use Avira, but it would be nice to win! Happy Hollidays! Is there any time limit for this giveaway to end? And declare the winner/s? Is this a real giveaway? If yes, count me in. i also like Avira very much but the only virus that is troubling me with Avira is the Vb Script file that mostly come with an affected USB and it does’t detect it and creates shortcuts of the exe files in the USB and hides the original files….. I will be moving to another antivirus suite once my current subscription to avira expires.